Presbyterians worshiped in Mount Pleasant as far back as 1812 when a travelling Presbyterian minister, Rev. J. Collver of Long Point, preached in Simcoe, Oakland and Mount Pleasant. After his death Rev. John Bryning, took over by gathering the remnants of Collver's congregations together. In 1830, the Mount Pleasant Presbyterian pioneers invited Rev. Bryning to be their resident minister giving him a house and garden. Even after Rev. Bryning was no longer the minister for the Presbyterians, he still conducted services in his home and performed weddings for those who requested the services of this beloved man. In 1832, the Bethesda Chapel was built for the use of the Episcopal Methodists and United Presbyterians of the Province of Upper Canada. 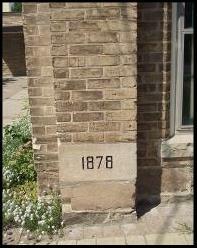 Records show a Presbyterian Church was later built in 1843 on Burtch Road across from the Mount Pleasant Cemetery. 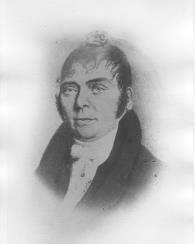 Rev George Murray, a missionary from Glascow officiated at the first service and ministered to the congregation until 1851. The small frame church was replaced by the present building which opened in October 1878. Much of the work on the new church was done by members of the congregation. The Bryce, Eadie, Young, Burr, Rutherford, McEwen and Gribben families were all represented. The building was to accommodate church services, Sunday-School and community activities. Sheds were built behind the church for horses and buggies. A manse was built next to the church in 1884 and Rev. R. G. Sinclair was the first Minister to live there. He planted maple trees around the grounds. Some of the original maple trees still remain. The manse housed ministers up to the late 1950's when Knox Presbyterian Church purchased a house for a manse and the ministers chose to live in Brantford. 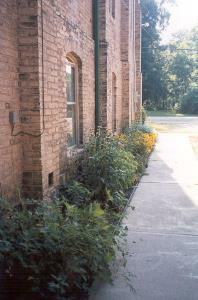 After years of renting, the Manse was torn down and the area turned into a Memorial Garden, dedicated on May 12, 2002. Mount Pleasant Presbyterian Church has been partnered with other Presbyterian Churches in the past. 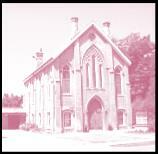 Burford Presbyterian Church became a two point charge with Mount Pleasant in 1872 under the Rev. Thomas Alexander. Burford closed in the early 1920's. The pewter communion set from that church is on display in Heritage Hall. In 1924, St. George Presbyterian Church became associated with Knox, Brantford and Mount Pleasant Presbyterian Churches and Rev. J.W. Whillans was inducted to the charge. In 1934, Knox Presbyterian Church, Brantford became a two point charge with Mount Pleasant, and this connection continued until the two congregations amalgamated in June 2012. In the 1960's, an auditorium was added. Once again, most of the work was done by members of the congregation. Bonds were sold to the congregation to help finance the addition. The hall includes a kitchen, stage and washrooms and is the meeting place for the Sunday School and many church events. Named St. Andrew's Hall, it was dedicated on October 10, 1963. Later, the former Sunday-School room was named Heritage Hall. A new chapter in the church's history took place on June 1, 2012 when Knox Presbyterian Church, Brantford amalgamated with Mount Pleasant Presbyterian Church. The first service for the combined congregations was held June 3, 2012, conducted by Rev. Dean Adlam. With the sale of Knox Church, furnishings that were memorial donations are now permanent fixtures in the Mount Pleasant sanctuary and in Heritage Hall. Rev. John Bryning established a strong foundation for Presbyterians in the village of Mount Pleasant. In October of each year, we hold an Anniversary Service, celebrating the Scottish heritage of the Presbyterian Church. We dedicate it to the pioneers and those who came after to ensure that a Presbyterian church survived in our village.